Skillfully drawing on three elements found in abundance in southern climes—sun, sea and air—Fernandez deconstructs the interior design features of Palm Beach living spaces, providing the reader with a kind of ‘how-to’ guide for achieving those same elegantly-layered results. Cleverly, she guides us through and around some of those high-priced roadblocks that would limit many, offering off-the-shelf and creative design alternatives to achieve similar sophisticated outcomes. If you sense a road trip coming in her suggestions, you’re right. Fernandez takes us out into the galleries, shops and retail venues where an inspired and knowledgeable eye can acquire the components for assembling a dazzling living room, den or patio statement. 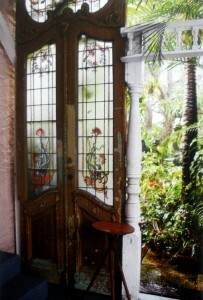 Left: Antique door salvaged from Brooklyn building leads to owner’s West Palm Beach home. All photos: Alissa Dragun. 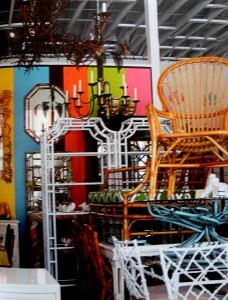 Right: Vintage is re-imagined by Tracy DeRamus on the sales floor of Circa Who, Northwood, Florida. A dominant theme in our home surroundings, Fernandez asserts, is often because of memories from childhood. This, and other emotional cues can serve as a starting point for achieving a finished design. But, while she stresses this link to the past, she cautions the reader not to be guided by pure emotion, alone. The creation a contemporary Palm Beach panache home, in the author’s view, is best achieved by embracing three dominant design influences—all paradoxically from previous centuries. The aesthetics of Mid-century Modern, Lilly Pulitzer-inspired colors and patterns, and French or Parisian Chic can flow together when carefully and meaningfully blended by a thoughtful and inspired homeowner. 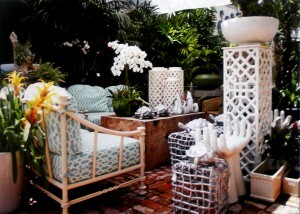 Left: White ceramic accessories, planters, succulents, all-weather fabrics and more, all at West Palm Beach’s Floral Emporium. And here, Palm Beach Panache serves as an excellent guide, like the street map to a visitor on foreign shores. Helpfully divided into sections, she notes that her text, images and captions should all carry equal weight for the reader, providing carefully segmented chapters on defining, developing and expressing design objectives. The tone of Fernandez’s language repeatedly drives home a point: she is there to help the reader, like a caring coach on the sidelines hoping key lessons learned can be imparted from a distance; but also knowing she can’t be directly involved in the game. The coup de gras in her detailed 180-page, full color text is the Resources section, where Palm-Beach-based vendors, retailers and other resources mentioned in the text are carefully identified. Everything from thrift shops to French antique dealers; silver to shells are spelled out. 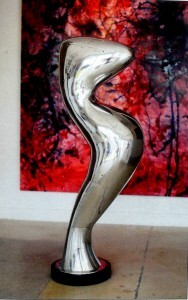 Right: William Halliday, Twist (2007), polished aluminum, 54″ tall. At Arthouse 429. Carolina Fernandez is a student of the art of the Beautiful. Her book, and her life in this magical place called Palm Beach, has been a journey to locate that elusive quality called ‘beauty’ and share it with her readers. 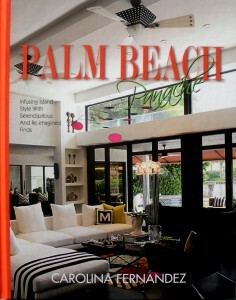 Palm Beach Panache is not so much the story of a finished product as it is a diary about that journey. It offers a guiding hand of informative images and advice to aid in the reader’s own quest of discovery, regardless of where they might live or choose to begin that search. Nicely done. Very enjoyable read. Absolutely wonderful review of an incredible masterwork by Carolina. I thoroughly enjoyed it from cover to cover, and it will prove to be an invaluable resource and richly illustrative inspiration for years to come!